Why not come along and help us at an Event? 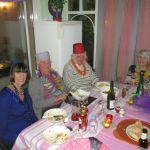 We appreciate that everyone has a lot to do these days but every little helps and we and the benificiaries of our charitable work would appreciate any time that you can spare to help with our events. Why don't you contact the Club Secretary Richard Maynard on 0345 833 9506 or make yourself known via the Contact Us page. 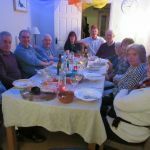 Whilst we primarily spend time raising funds and undertaking community service activities, there is always time for us to get together for social occasions, with lunches, dinners and outings which bring us and our partners together in friendship. Membership is normally by invitation but if you are interested joining us please download the Membership Enquiry Form and complete your contact details and then email it back to us or send your contact details direct via email at: eganddlions@gmail.com We would be pleased to welcome you to one of our meetings where you can have an opportunity to see what we do and talk to the team. The Fundraising and Community Service Chairman both have a small team drawn from the membership to assist them with activities that they are engaged in. To read more go to Fundraising or Community Service for more detail. Please also see the Supporters Page for details of the 200 Club. 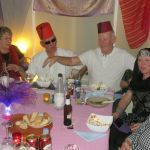 The Club meets on the first Monday (providing that is not a Bank Holiday) of each month starting at 8.00 pm to talk about plans and discuss the running of the club and its activities. These monthly Business Meetings ensure we stay on track, raise enough money to fulfil our community plans and enjoy a sociable beverage afterwards. The location is a meeting room 'above' the British Legion Club 4, Station Road, East Grinstead West Sussex RH19 1DJ. A map is available to view by Clicking Here. Visitors and non lions wishing to attend should contact the Club Secretary Richard Maynard on 0345 833 9506 or via the Contact Us page. 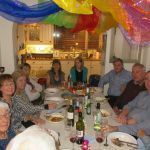 During the year our members hold a number of social events including Charter Anniversary Dinners, Travelling Lunches, Outings, Suppers, etc. Our aim is to ensure that whilst we work hard to support our community, we can have some fun and enjoyment as well. 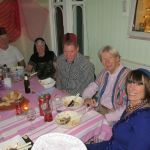 The pictures below were taken at a recent supper evening. The International Association of Lions Clubs, better known as Lions Clubs International, was the brain child of Melvin Jones and came into being on 7th June 1917, in October of that year the first Convention was held and a total of 22 Clubs attended. The first Club to be formed outside the United States was Windsor, Ontario, Canada and so the International Association was started. The first Lions Club in the UK was formed in 1950 as a result of the influence of US Servicemen here during the war. In recording the events run by the club, we reserve the right to take photographs to advertise our activities. However, we seek permissions where possible and appropriate, particularly in respect to young people, from Teachers, Staff and Parents and otherwise assume that people in more general scenes who are photographed agree to the publication of the pictures unless they notify us to the contrary. The East Grinstead Town Crest shown on the Welcome Page is used with the kind permission of the Council and the Mayor. dated 9.3.16.